Sputnikfest is this weekend. Why? Because on September 5, 1962 a piece of the Soviet spacecraft Sputnik IV came crashing to earth. One 20-pound chunk came careening down in – of all places – Manitowoc, Wisconsin. This piece of Sputnik crashed down onto 8th Street in town, right in front of the Rahr-West Art Museum. 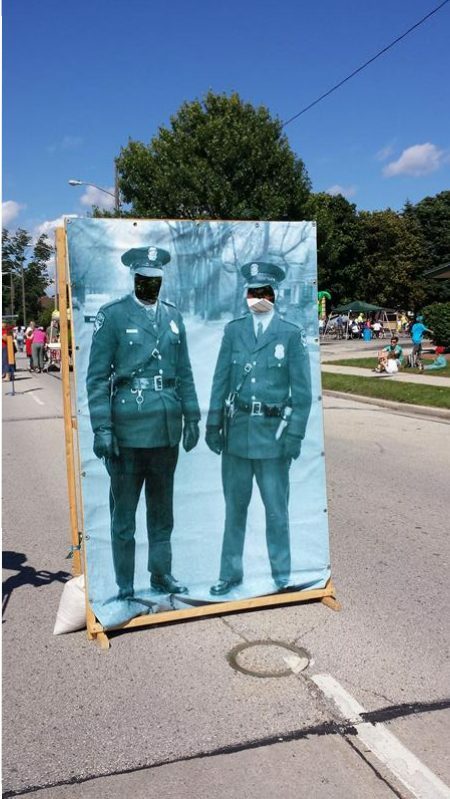 Two policemen closed the street and stood in front of it, creating an iconic photo for the local paper. Once it cooled, it was taken, examined, and eventually returned to the Russians. 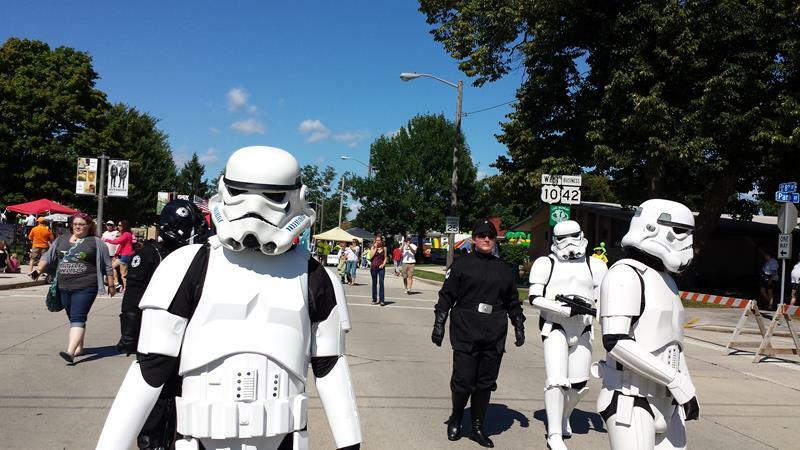 Its legacy lives on in Manitowoc with Sputnikfest, an annual celebration of space, spacecraft, and other out-of-this-world. It happens Friday night and Saturday, September 7-8 in Manitowoc. Here are some facts about it and why you should go! 1. The precise spot where a piece of Sputnik landed is marked right on 8th Street – and you can stand there. 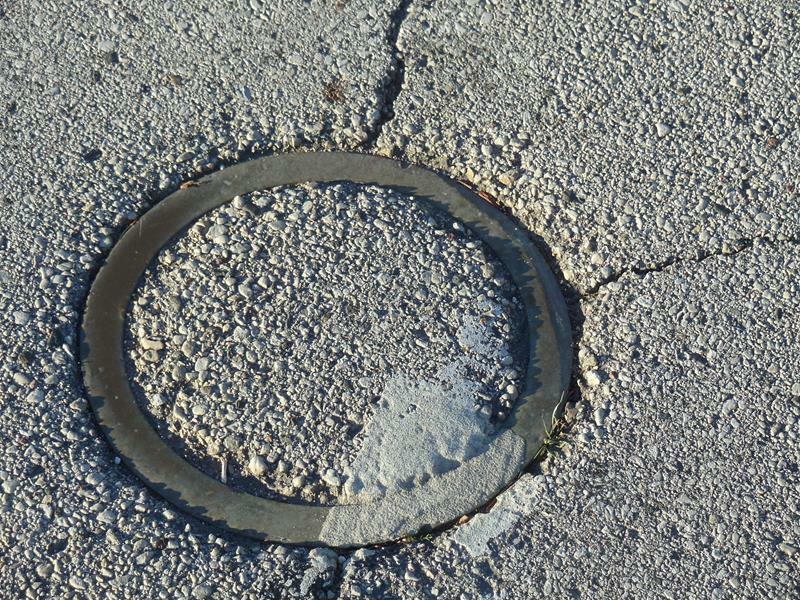 Embedded in 8th Street is a metal circle that shows the exact spot where a 20-lb. piece of Sputnik IV crashed. While it’s normally in the midst of traffic lanes, during Sputnikfest this section of road is closed off for the festivities. You can stand in front of the exact spot where it landed out of the blue (and out of the sky) and be glad you weren’t standing there on September 5, 1962 or else you’d have one heck of a headache! 2. Sputnik was a test craft; some thought it was manned. When the Russians launched Sputnik IV (or “Korabl-Sputnik 1” as they called it), they intended it to be a test spacecraft to see if human flight was possible. To that end, they included a mannequin in the original craft, which led some to believe that a cosmonaut was on board. None was, but it certainly led to plenty of speculation back then that Manitowoc may have had a foreign (or even otherworldly) visitor. Some attend Sputnikfest today dressed as cosmonauts, astronauts, or their favorite space action figure. Many hope to win the costume contest, which gets more outlandish every year. 3. Sputnikfest crowns a “Ms. Space Debris” every year. 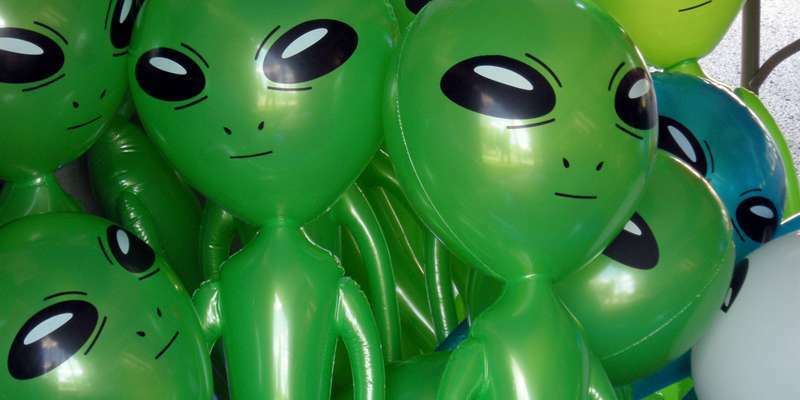 While the main Sputnikfest activities take place is Saturday, plenty of fun happens with the “Aliens in the Alley” celebration the night before. During a Friday night party, The Happy Schnapps Combo will play and Sputnikfest hosts their Out of This World Trivia Contest. They’ll also crown “Ms. Space Debris”, a pageant winner who manages to impress in the categories of a) Space-Age evening attire; b) a display of talent, and c) a brief Q&A period. The rules don’t even stipulate that Ms. Space Debris needs to be female, but merely a “human life form.” No word of which bathroom they may use. 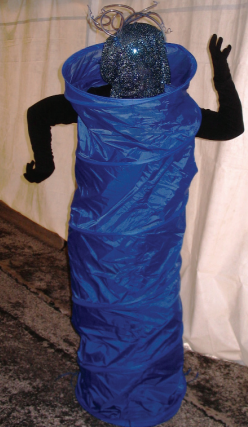 Regardless, Ms. Space Debris reigns over the Fest, presiding over events like the Cosmic Cake Contest, Aluminum Foil Costume Contest, the Alien Pet Competition, and even some things that aren’t contests or competitions. There are a handful of promotional events throughout the year where Ms. Space Debris makes her (or his, or its, whatever) presence known. 4. Even the organizers call it a “wacky, tacky event”. How can you miss?? Even the promoters like to call events like the Cosmic Cake Contest and the Alien Pet Competition “wacky, tacky events.” The Alien Drop, which features the dropping of tiny alien figures from a cherry picker, allows kids to grab prizes. Go-kart races along 8th Street add a competitive flair, and between live music, outlandish costumery, and dancing space aliens it’s definitely a unique time for all. Plus Manitowoc offers plenty of other great things to visit while you’re there, from the Wisconsin Maritime Museum and the SS Cobia submarine to a nice free city zoo and the host location for Sputnikfest: the lovely Rahr-West Art Museum, which includes a scale replica of the piece of Sputnik that landed here. 5. Sputnikfest draws space fans, engineers, and actual rocket scientists. While the fun can be wacky, the fact is this was a true piece of spacecraft, still glowing from the heat of re-entry when it landed. With the earth covered mostly be water, any surviving spacecraft pieces falling on land – especially in the middle of a city – becomes a unique event. Fans of spacecraft, satellites, rockets, science, science fiction, and more show up to Sputnikfest every year to marvel at the science and history of it all. Some wacky, tacky fun helps. After all, rocket scientists like to have a good and goofy fun time, too! You’ll find Sputnikfest taking place just north of downtown Manitowoc primarily along 8th Street (U.S. 10 and Business Highway 42.) U.S. 151 ends about 1/2 mile south of there; the festivities are only about 8-10 minutes in from I-43’s exits to Manitowoc. The party starts Friday evening September 7th and lasts all day Saturday, September 8th. You can get more details by calling (920) 686-3090 or visiting the Sputnikfest website. Check it out for an otherworldly experience!